So it’s coming to an end. A journey that began as an obsession after hearing a relative’s son getting one of those dream placements (Yes, I too am a part of the crowd that came in with probably the sole purpose of getting a hefty pay cheque and a good brand on the CV :P). With just three months left, the nostalgia has already started setting in, so much that I dropped the idea of going back home in the term break and decided to spend some more time on campus. As I look back at the 18 odd months that went by, I can’t help but think of what I really learned here. Surely the 5Ps, GTM, PESTEL, and PORTER will help me survive those boardroom meetings, but it is some of the finer lessons that this place taught me which will help me flourish in life. One of our professors once said – “Remember why you came here. These colleges are called b-schools for a reason”. In fact, these lines are probably the only things I imbibed from that course. Except of course a lot of outlandish stories on branding and consulting projects. (The folks from my section reading this would easily guess the prof :P). But jokes apart, there’s a lot of haze and distraction to get lost into. At the risk of sounding preachy, all I would say is all of us want to achieve something in life. Just keep reminding yourself what that thing is. It may sound clichéd, but it’s tough to implement. Over the course of your MBA, things may seem unfair at times. But that’s how the world works. At times you get out of turn benefits and at times you don’t! Don’t crib about it. There will always be someone telling you that such a thing happened because he/she knew that person. Ignore such people. Work on things that you can control and ignore what you can’t. Think of it as the law of averages. It will all balance out sooner or later. A b-school curriculum is designed in such a way that it feels like one is running a sprint. There is hardly any pit stops to refuel and continue the race with renewed vigour. Amid all the chaos it becomes exceedingly important to take some time out and ponder over what/why/how you are doing things. Invest time in yourself. Know your strengths and weaknesses. Try and find out what is it you can really be good at or what gives you ultimate satisfaction. I am not saying that I had an epiphany one fine day and the purpose of life instantly became clear. I am probably as confused as anyone of you reading this. But those small bouts of introspections at least helped me figure out my priorities on campus and to some extent life as well. If you really want it, go get it. Yes, it’s that simple. I came here with a lot of apprehensions, the biggest one being the lingering doubt that will I be able to survive in this place. After all, this is where the so-called best ‘resumes’ of the country are. And there I was coming from a college that I bet you haven’t heard of and nothing extraordinary to get that ‘spike’ on my resume. Yet I survived and maybe thrived. Got decent marks, won a few case competitions and ended up with good placements. Practically ticked off most of the things on my checklist. Surely there were a few lows in the way, but the things that kept me going were a lot of hard work, some amount of good luck and a few good friends. A line by Anurag Kashyap often comes to my mind, and I quote him again – “The world doesn’t owe it to you. You owe it to yourself.” If you really want it, go get it. 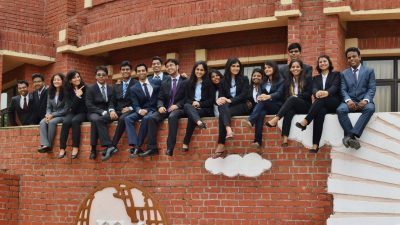 Samaksha Vaish is a second year student at IIM Lucknow. He is also a member of the Industry Interaction Cell and Manjunath Shanmugam Trust. Your takeaways will definitely guide us ,who hv just started the journey..